Macau Macao, is one of the two Special Administrative Regions of the People's Republic of China, the other being Hong Kong. Macau lies on the western side of the Pearl River Delta across from Hong Kong to the east, bordered by Guangdong Province to the north and facing the South China Sea to the east and south. The territory's economy is heavily dependent on gambling and tourism, but also includes manufacturing. The Cantonese people from Hong Kong and Guangdong, especially recent mainland tourism from Mandarin-speaking regions, have boosted the economy of Macau significantly. A former Portuguese colony, Macau was administered by Portugal from the mid-16th century until late 1999, when it was the last remainingEuropean colony in Asia. Portuguese traders first settled in Macau in the 1550s. In 1557, Macau was rented to Portugal by the Chinese empireas a trading port. The Portuguese administered the city under Chinese authority and sovereignty until 1887, when Macau became a colony of the Portuguese empire. Sovereignty over Macau was transferred back to China on 20 December 1999. The Sino-Portuguese Joint Declaration and theBasic Law of Macau stipulate that Macau operate with a high degree of autonomy until at least 2049, fifty years after the transfer. By 2002, it had become one of the world's richest cities. It became the world's biggest gambling centre in 2006. Before the Portuguese settlement in the mid-16th century, Macau was known as Haojing . The name Macau is thought to be derived from the A-Ma Temple , a temple built in 1448 dedicated to Matsu – the goddess of seafarers and fishermen. It is said that when the Portuguese sailors landed at the coast just outside the temple and asked the name of the place, the natives replied (Mandarin Pinyin). 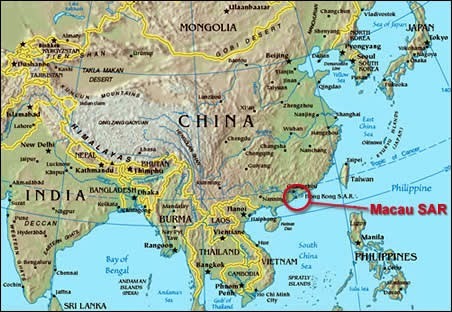 The Portuguese then named the peninsula "Macau"